From her childhood encounters with discrimination to her activism as an adult, Coretta Scott King dreamed of finding a place where people were treated equally. This compelling biography tells the story of how she came to stand up against prejudice and violence during the African-American Civil Rights Movement. 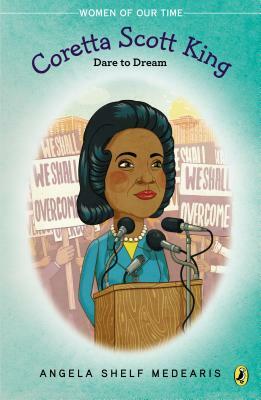 "A readable account of the life of Coretta Scott King... this biography shows her to be a courageous woman who can stand on her own merit, and not just as the wife of one of the world's most well-known men." International in scope, the Women of Our Time series of biographies cover a wide range of personalities in a variety fields. More than a history lesson, these books offer carefully documented life stories that will inform, inspire, and engage. Angela Shelf Medearis is the author multiple books for children on African-American history. She has also written several cookbooks including The Kitchen Diva's Diabetic Cookbook: 150 Healthy, Delicious Recipes for Diabetics and Those Who Dine with Them. She lives in Austin, Texas. "A concise, engaging biography for young readers... A fine addition to easy-reading biography collections."